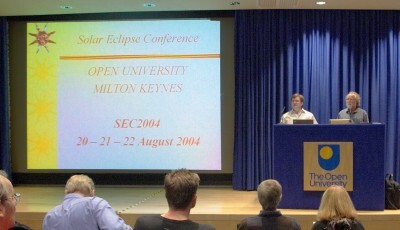 The files linked below were recorded at the 2004 Solar Eclipse Conference, held in the Berrill Theatre at the Open University Milton Keynes in the UK. For general information about the conference, please click here. These recordings were made with an inexpensive MP3 recorder, not professional sound recording equipment, so please accept my apologies for the audio quality. To save a file to your local computer, right click an 'MP3 file' link and select 'Save Target As...'. These mono 32kbps MP3 files should be compatible with virtually any player. If you do encounter a problem saving or playing a file, please contact me. 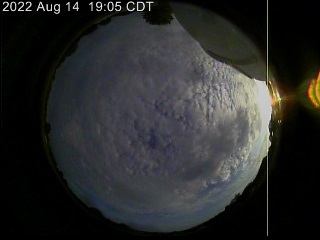 Return to Fred's Solar Eclipse index. All text and images are © 2004 Manfred Bruenjes - All Rights Reserved. Image inlining (aka hot linking) and framing are strictly prohibited. Email for permission before using an image or text.